Introduction: Thalassemia is among the common hereditary disease, caused by synthesis of defective haemoglobin, leading to ineffective erythropoiesis, chronic haemolytic anaemia and certain clinical complications. Various treatment options are available for treatment of β–thalassemia major including regular blood transfusion, iron chelation therapy and hydroxyurea. Although complications and poor survival is still major problem in these patients. So treatment with alternative drugs can be helpful in management of these patients. Methods and materials: Prospective study, conducted at a tertiary care hospital. Study included 70 known cases of transfusion dependant thalassemia major. Age, gender, haemoglobin and serum ferritin levels were analyzed before and after treatment with thalidomide. All data were collected and analyzed in SPSS 21.0. P–value of <0.05 was considered as statistically significant. 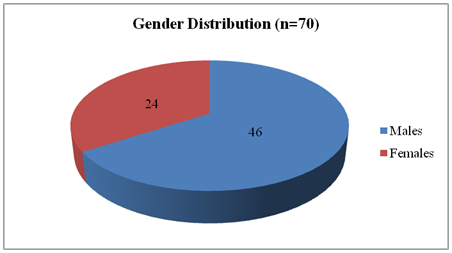 Results: Among 70 patients, 46 were males and 24 were females (male to female ratio=1.9:1). Mean age of the patients was 10.31±1.24years. Before and after treatment with thalidomide, mean haemoglobin was 8.93±1.04g/dL and 10.54±1.18g/dL respectively (p=0.011). 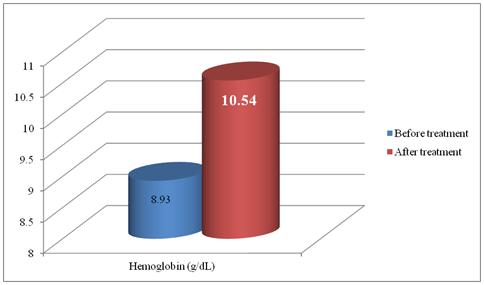 Before and after treatment, mean serum ferritin level was 3125±143.51ng/mL and 1241±135.94ng/mL (p>0.001). Conclusion: Thalidomide proved to increased haemoglobin levels and reducing ferritin levels in patients with β–thalassemia major. We analyzed the effect of thalidomide in patients with β – thalassemia major. It was a prospective study conducted at a tertiary care centre. 70 patients were included in this study. All patients were known cases of transfusion dependant β–thalassemia major. Study was performed from October 2017 to April 2018. Thalidomide was given at a dose of 2mg/kg to 10mg/kg for 6months. Age, gender, haemoglobin levels, ferritin levels before and after therapy were assessed in all patients. 2 blood samples from each patient were taken. One sample was taken in tube containing EDTA for evaluation of haemoglobin levels. Other sample was taken in tube containing Gel for evaluation of serum ferritin. All data was collected and was analyzed in SPSS 21.0. This study included 70 patients, including 46 males and 24 females. Male to female ratio was high (1.9:1) (Figure 1). Age of patients was ranged from 7years to 12years (mean=10.31±1.24years) (Table 1). Haemoglobin and serum ferritin levels were measured in all patients before and after treatment thalidomide. Before treatment, haemoglobin was ranged from 7.23 to 9.41g/dL (mean=8.93±1.04g/dL), while after treatment with thalidomide, it ranged from 9.83 to 11.21 (mean=10.54±1.18g/dL) (Table 1 & 2) (Figure 2). There was statistically significant difference (p=0.011). Before treatment, serum ferritin was 2538 to 6429ng/mL (mean=3125±143.51ng/mL), while after treatment, it was 873 to 1582ng/mL (mean=135.94ng/mL) (Table 2 & 3) (Figure 3). The difference was statistically significant (p<0.001). Clinical features of patients are described (Table 3). All patients showed different transfusion frequencies (Table 4). Figure 2 Haemoglobin levels before and after treatment (n=70). 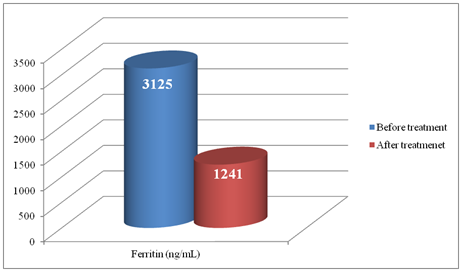 Figure 3 Serum ferritin levels before and after treatment (n=70). Thalassemia is a group of hereditary haemolytic anaemia caused by disruption in the production of haemoglobin chains. Various treatment options are available but the overall compliance, standardization and compliance is poor, due to which many complications develop in patients with thalassemia.9,10 Thalidomide is not commonly used in the patients with thalassemia as its role is not fully understood. In our study we evaluated the role of thalidomide to see its effect on haemoglobin and serum ferritin levels. It was found that mean haemoglobin levels was increased after treatment with thalidomide, while serum ferritin levels significantly decreases after treating with thalidomide. It is strongly suggestive of effect of thalidomide on HbF and also reduction in iron deposition. Various studies proved to be in favour of our study by showing similar results. Thalidomide showed strongly positive results in patients with β–thalassemia major. Although our study was performed on fewer number of patients so more studies on large populations should be carried out to see strong findings and evidences. Our study did not evaluate the optimal transfusion interval in these patients as there was poor compliance and uneven follow-up of patients at the time of transfusion. Status of splenectomy was not included in this study, so further evaluation is needed in these patients on other parameters as well. Kaveh Tari, Pooya Valizadeh Ardalan, Mahnoosh Abbaszadehdibavar, et al. Thalassemia an update: molecular basis, clinical features and treatment. Int J BioMed Public Heal. 2018;1(1):48–58. Fibach E, Rachmilewitz EA. Pathophysiology and treatment of patients with beta‒thalassemia–an update. F1000Res. 2017;6:2156. Nihar Ranjan Sarker, Ashis Kumar Ghosh, Santosh Kumar Saha, et al. Recent advances in the management of Thalassaemia : A Review Update. J Shaheed Suhrawardy Med Coll. 2014;6(1):31–7. Mettananda S, Gibbons RJ, Higgs DR. α‒Globin as a molecular target in the treatment of β‒thalassemia. Blood. 2015;125(24):3694‒3701. Rund D, Rachmilewitz E. New trends in the treatment of beta‒thalassemia. Crit Rev Oncol Hematol. 2000;33(2):105‒118. Dharmesh Chandra Sharma, Anita Arya, Purnima Kishor, et al. Overview on Thalassemias: A Review Article. Med Res Chron. 2017;4(3):325–337. Ramanan V, Kelkar K. Role of Thalidomide in Treatment of Beta Thalassemia. J Blood Disord Med. 2017;3(1):8–10. Ng NY, Ko CH. Natural Remedies for the Treatment of Beta‒Thalassemia and Sickle Cell Anemia‒Current Status and Perspectives in Fetal Hemoglobin Reactivation. Int Sch Res Notices. 2014;2014:123257. Cappellini MD, Porter JB, Viprakasit V, et al. A paradigm shift on beta‒thalassaemia treatment : How will we manage this old disease with new therapies? Blood Rev. 2018;32(4):300‒311. De Dreuzy E, Bhukhai K, Leboulch P, et al. Current and future alternative therapies for beta ‒ thalassemia major. Biomed J. 2016;39(1):24‒38. Fozza C, Pardini S, Giannico DB, et al. Dramatic erythroid response to low‒dose thalidomide in two patients with transfusion independent thalassemia and severe post‒transfusional alloimmune hemolysis. Am J Hematol. 2015;90(7):E141. Jalali Far MA, Dehghani Fard A, Hajizamani S, et al. Thalidomide is more efficient than sodium butyrate in enhancing GATA‒1 and EKLF gene expression in erythroid progenitors derived from HSCs with β‒globin gene mutation. Int J Hematol Oncol Stem Cell Res. 2016;10(1):37‒41. Masera N, Tavecchia L, Capra M, et al. Optimal response to thalidomide in a patient with thalassaemia major resistant to conventional therapy Case description. Blood Transfus. 2010;8(1):63‒65. ©2018 Jiskani et al. This is an open access article distributed under the terms of the Creative Commons Attribution License , which permits unrestricted use, distribution, and build upon your work non-commercially.